26 Ton Articulated Hauler Rental – Caterpillar – 725, is available for rent in Rochester NY, Ithaca NY and the entire Western New York region from the Duke Company. The rental Caterpillar 725 articulated hauler available to rent, is a powerful earthmoving machine with proven 26 ton payload. 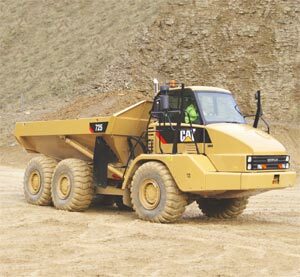 Caterpillar is known for its reliable, durable, productive machines with operator comfort and low operating costs. The engine is a powerful Cat C11 ACERT generating 309 horsepower (gross).